Successfully Added Bluetooth Fitness Tracker Bracelet - Pedometer, Heart Rate Monitor, Blood Pressure, Sleep Monitor, Calories Burned, App Support to your Shopping Cart. This Bluetooth fitness tracker bracelet is a stylish health gadget that will guide you on your way to reaching the fitness level that you have always dreamt off. With its wide-range of smart health and fitness features, this Bluetooth sports tracker helps you to lose weight, gain muscle, and increase cardio. The fitness band itself has been crafted out of a soft and comfortable material and has a stylish look. Thanks to this, you’ll be able to wear it throughout the day no matter where you’re headed. Thanks to its pedometer, your fitness gadget will keep you up to date on your daily activity levels by showing the total number of steps you took, distance covered, and calories burned. Along with its pedometer, this Bluetooth sports watch features a heart rate monitor and blood pressure sensor. These two features will provide you with valuable information on the current status of your body and stamina. Based on this info, you’ll be able to adjust the intensity of your workouts so that you can be assured you train in the most efficient manner. With its sedentary reminder in place, this gizmo makes sure that you’ll never miss out on a work out session again. Thanks to Bluetooth 4.0, you’ll be able to efficiently synchronize this fitness tracker with your smartphone. Through the dedicated mobile application, you can use it with both iOS and Android phones. Once connected, it does not only treat you to plenty of smart fitness features but also to call and message reminders. Thanks to this, you’ll never miss out on an important message again while you’re out exercising. With its 100mAh battery, your Bluetooth watch treats you to a stunning 120 hours of continuous usage time. 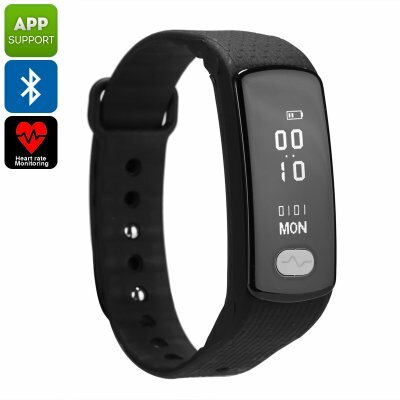 This fitness tracker bracelet comes with a 12 months warranty, brought to you by the leader in electronic devices as well as wholesale Bluetooth watches..